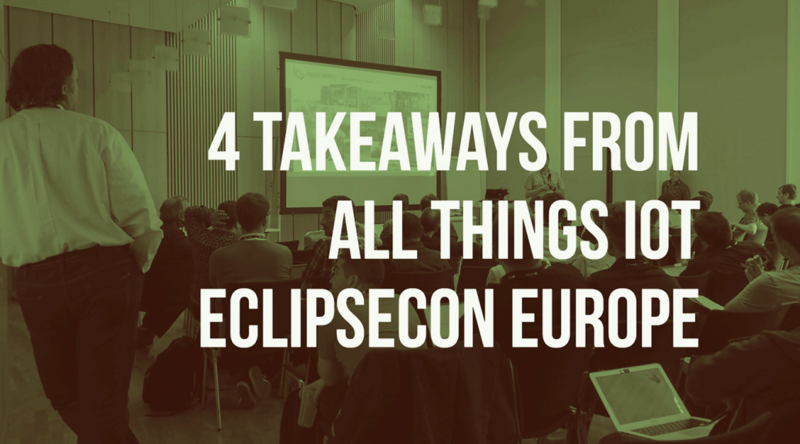 Last week, the Eclipse IoT community was pretty busy at EclipseCon Europe. We were having our largest Eclipse event of the year, and it featured lots of IoT. After a much needed weekend break to recover from an incredibly fruitful week, I am taking some time to write down some of my personal takeaways. I was really pleased with the turnout of the IoT Day. What was particularly interesting was hearing not only community insiders tell us about what they are doing for, and with, Eclipse IoT projects, but also getting the point of view of people who are pure consumers of the technology. 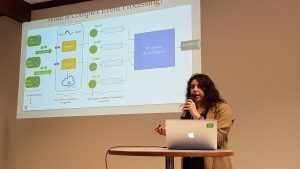 This year, for example, we had people like Müge Kural (Eteration) or Nicola La Gloria (Kynetics) telling us how projects like Eclipse Kura or Eclipse hawkBit have helped them implement use cases such as advanced dashboards for Electric Vehicles, or scalable software updates for Android-based IoT devices. Look out for the video recordings of their talks, in the meantime, you can read more about Kynetics’ story in our recently published case study. 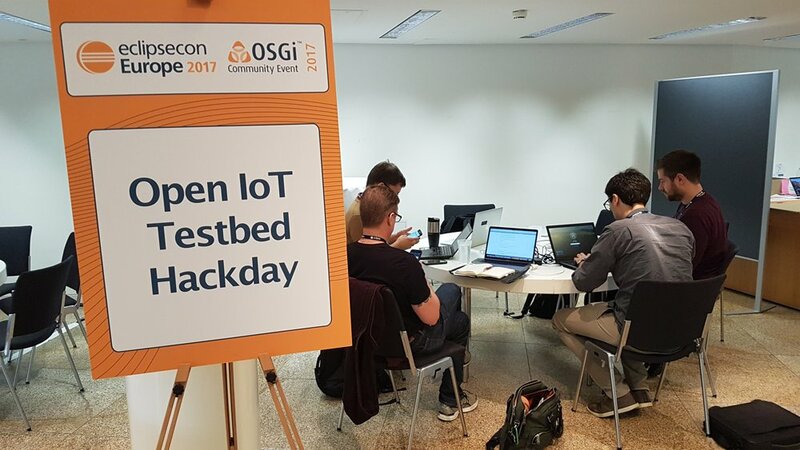 As you probably know by now, we are ramping up our Open IoT Testbeds initiative, and it was great to use EclipseCon Europe as an opportunity to spend some quality time with the different companies involved in the testbeds and discuss next steps. To encourage collaboration, we held a “hackday” on Wednesday. There was a strong focus on the Industry 4.0 / Production Performance Management testbed, and it was great to see participants from different companies sitting at the same table, brainstorming about the roadmap for the next few months. One of my action items from the hackday was to get a mailing list set up. So, if you want to get more involved in the testbeds, you can now subscribe to iot-testbeds@eclipse.org to participate! 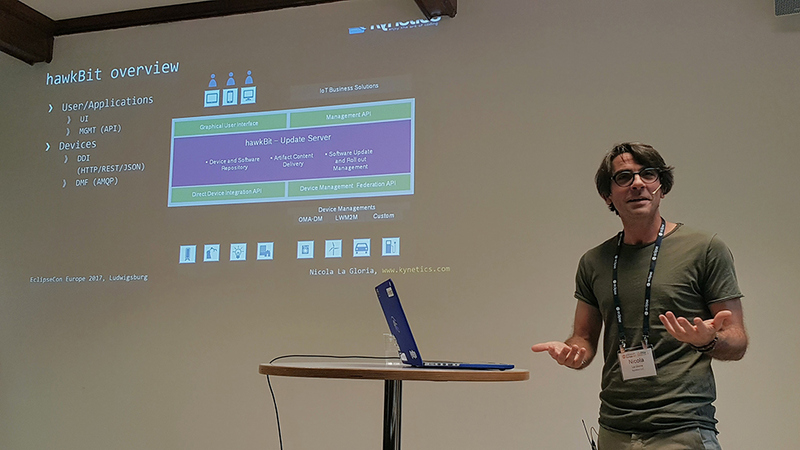 EclipseCon Europe coincides with the anniversary of the Eclipse IoT Working Group, and 6 years into the adventure it is great to see that this year, even more than others, the project teams spent a lot of time discussing how to better integrate the different projects with one another. 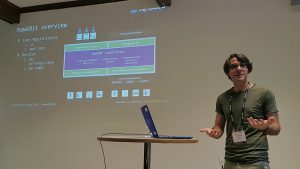 For example, it has become pretty clear that Eclipse hono will probably become the de-facto standard for device connectivity, and there were lots of discussions on how to provide hono protocol adapters for PPMP (Eclipse Unide), OPC-UA (Eclipse Milo), or Eclipse Kura gateways. Also, at the IoT WG meeting, we discussed how to structure the community work better and collaborate towards a more integrated Eclipse IoT stack. It has been proposed that we establish a sub-committee of the IoT WG dedicated to integration work. Expect to see more on that topic soon! You may have seen the news: just a week before EclipseCon, two new Eclipse IoT project proposals have been announced. First is Eclipse Thingweb, a project that will be hosting an open-source toolkit for the W3C Web of Things ecosystem. Matthias Kovatsch from Siemens presented the project, and you can get his slides here. The other project, Eclipse Cyclone, will put an open source implementation of the DDS (Data Distribution Service) middleware standard of IoT developers. Hans van’t Hag from ADLINK gave the presentation below, and his slides are here. I am looking forward to seeing these projects move to Eclipse IoT over the next few months!